The Alpina Control NIS Nordic Ski provides a lightweight, stable platform for spending long hours on the trail. The SNS Interface Adapter is a thin composite plate with pre-drilled holes to match Salomon Profil and Pilot race bindings. The plate enhances the performance when Salomon bindings are mounted on skis with NNN-NIS plates. While not an absolute necessity, the interface adapter prevents over-tightening of mounting screws. Also, some snow conditions increase the icing of Pilot bindings if they are mounted on NIS plates without the adapter. While it is nice to be able to crank turns using nordic skis in backcountry snow, most boots that give you that control often negate the touring part. Unless you like backcountry skiing in a boot that feels like a cast, take a look at the Salomon X-ADV 6 touring boot. Deeply lugged sole for grip when you have to take your skis off. Very popular with the international elite, including skiers at the Vancouver Olympics. The SNS Wedge is a plate that is mounted between a skate ski and Salomon skate binding; the 5mm lift at the toe creates a ramp effect, lowering the skiers heel relative to the forefoot. 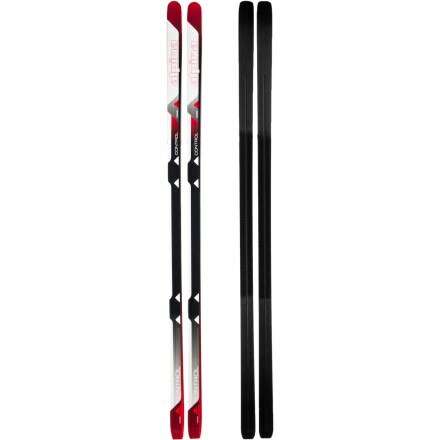 Salomon claims that this can improve ski acceleration and edge control, also promotes a longer kick. The Madshus Metis U Combi ski boot is perfect for the one-boot-woman who wants to skate, and kick and glide on training or rec. race days. The Madshus Maiya skate skis, for women, deliver stability, durability and economy. Its moderate sidecut strides easily, and the high-quality Torsion Cap construction and Polycell foam core put snappy performance into this training and racing skate ski. The Madshus Hyper U Combi boot is ideal for younger racers and the occasional competitor who only wants one performance boot for skate, classic, and pursuit. Snow day fun or teaching little ones to ski is big fun with the Madshus Snow Pup ski/binding package. They are wide and stable, with a NoWax(R) base to make walking easy, and they come in a pint-sized 85 cm length. The Madshus Snow Pup is packaged with a Universal binding, so you won't need special boots for your child's fast-growing feet. The CT 120 is a classic light touring design with a supportive ankle cuff. MemBrain(R) softshell construction, allowing the boot to comfortably conform to the contours of the foot while providing durability, waterproof protection, breathability, and warmth.